Even though there are many caches on the nearby trails there are no caches on this road. And with the recent road closure due to a landslide now seems like a good time to place a cache. Way back in the 90's Highland Road slide big-time. So big that I assumed it would never be rebuilt. 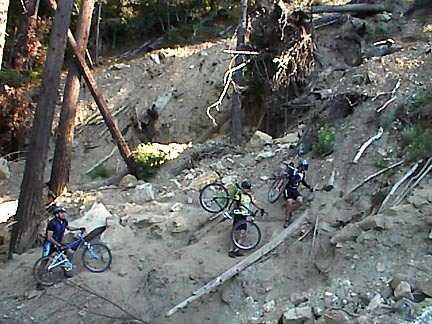 The mountain bikers got accustomed to carrying their bikes across the slide. But obviously driving a car was never an option. But the county proved me wrong and the road was rebuilt and everything was good in the world. At least until the Winter of 2005/06. We had record rains and the road slid again, but in a different spot. 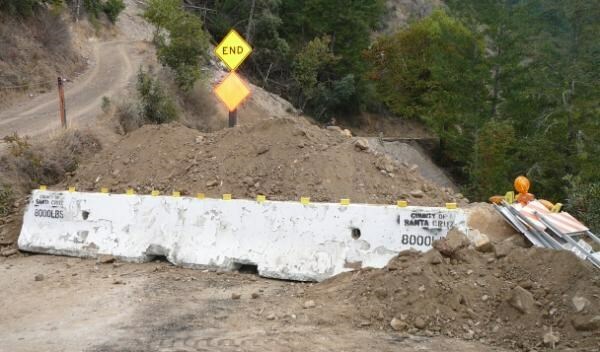 The local residents who would now have to drive down to the coast to Highway 1 and then over from Santa Cruz took matters into their own hands and cleared the slide so the road was one lane passable. Amazingly, the road did not slide during the following winter. 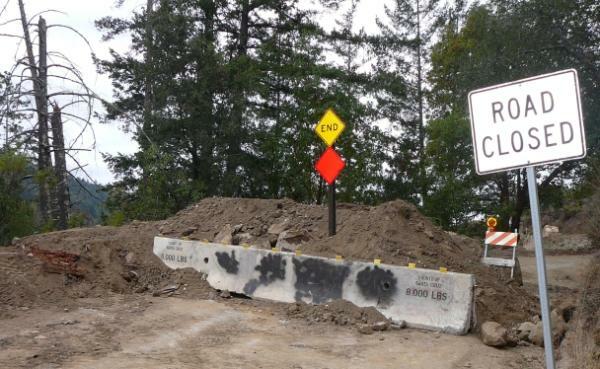 But it continued to get undercut until the county closed it by putting up 8000 lbs barriers. Those pesky residents were so unhappy about the prospects of having a much longer commute that they somehow moved the barriers. But ultimately the county won out by threatening legal action so the barriers are back up. Note that the road to the left is someone’s driveway that goes uphill. For those local residents this road closure is definitely a Major inconvenience. Instead of a 11 mile drive to the summit of Highway 17 it is now 40 miles. For those who use the road to get to Soquel Demonstration Forest the extra 2 mile bike ride each way is only a Minor inconvenience. To see the latest road status go to this link. The cache itself is located just past the original slide zone from the Summit Road side. If you drive up Eureka Canyon you can park right next to the cache. I set the cache up as a compilation CD exchange cache. To start it off there are 3 CD's, one ska music, one I made for a friend's b-day (various rock music) and another CD I found in a cache near San Luis Reservoir. If you decide to take a CD please have one to replace. And forget those bulky jewel cases. They take up too much space. Just put the CD in a paper or plastic envelop. When logging in your find please indicate what CD you took and what you left.